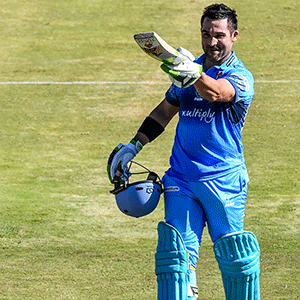 Cape Town - Titans captain Dean Elgar insists that their twin regular season One-Day Cup wins over the Cape Cobras will count for nothing when they face-off in the first semi-final in Centurion on Wednesday. "It was my conversation with the squad on Monday," Elgar stated. "The fact that we beat them in the round robin, it means nothing. It's a totally different scenario now and they are a team that plays finals cricket very well. "They're a very dangerous side and will have one dangerous Protea back in JP, which makes them a dangerous side again." Indeed, JP Duminy is one of four Proteas who become available again for their franchises - three of whom are back to bolster the home side. They are big guns Dale Steyn, Aiden Markram and Tabraiz Shamsi. "To win the trophy you have to go through the round-robin stage, the semi-final and the final," Elgar added. "You have to do well through all the phases and it's a pressure situation we've been put in. The Cobras lost their most recent game when they went down to the Warriors at the weekend, missing out on a home semi-final in the process. "We've not really managed any momentum at all, two in a row is the best we could get in the middle of the competition," the Cobras boss added. "But it's a very tight competition and if you look at the final standings, the Titans have won six and the next two managed five, so it's an indication of how tough the competition was."